Although good cultural practices are our first line of defense against diseases, lawn fungicides may occasionally be necessary. Lawn disease are naturally occurring and are caused by living microscopic organisms in and around the soil. To best control diseases using fungicides, it is necessary to understand the basic fundamentals of how lawn fungicides work. Organic Fungicides are the newest addition to fighting lawn diseases. These are certainly worth checking out, since most organics are less or non-toxic and safe for animals and pets. 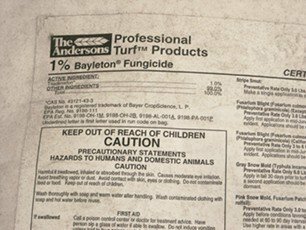 While some chemical fungicides are fairly safe, many chemical fungicides are hazardous and some are the most dangerous substances you can use. Use organics when possible. Many products like Agri-Gro Biostimulants and Actinovate Fungicide work extremely well and are perfectly safe. Agri-Gro biostimulants and Nutritional Supplements stimulate the naturally occurring beneficial soil microorganisms that suppress disease pathogens. When combined with AgriGro Super-Cal Calcium, it increased soil microbes by 3400% in 24 hours and 5000% in 72 hours. The University of Missouri/Columbia showed that it reduced brown patch disease pathogens by 35% with no fungicides. That is often enough to prevent an outbreak. Turf Formula also contains naturally occurring hormones, enzymes and amino acids that help defend plants when pathogens begin their attack. I use them and haven't had any problems with diseases in a few years. There is loads of university tests and field data to support these claims. If you use Agri-Gro on a regular basis you will lower your chances of getting diseases. Combine this with proper fertilization techniques and other maintenance practices and you will have far less problems. All AgriGro Products are safe around children and pets! Actinovate contains the same natural ingredients found in antibiotics. I have found when used in conjunction with organic composts or Renovate Plus or similar products, actinovate can help stop diseases and build healthier plants. Fungicides can be difficult to use and apply safely. The method of application varies greatly and can range from granules to drenches. They may come as dry powders that must be diluted with water or granules that are applied by a fertilizer spreader. They may come as concentrated liquids, that when mixed with water, are applied as other liquid fungicides. You need to be sure you have the right application equipment and personal protective equipment before using the product. Contact fungicides: Contacts remain on the outside of the plant and form a protective barrier against diseases that penetrate the leaf blade. Systemic fungicides: Systemics enter inside the plant and travel throughout the plant's vascular system. They are both protective and curative before and after the disease has started. After application, contact fungicides will remain on the surface of the plant. They do not penetrate or enter into the plant as systemic lawn fungicides do. The primary purpose of contact fungicides is to form a protective barrier against diseases that enter through the leaf blades. In most cases, it needs to be applied before the disease begins. Most Contacts have as short residual and are only effective for three to eight days. After that, it will need to be reapplied. The fungicide needs to remain on the surface of the blade the entire time to be effective. This means it should not be watered in. You will need to turn off your automatic sprinklers to keep from washing it off. If it rains after the application, it may need to be reapplied. Mowing or heavy foot traffic may remove the product from the grass making it less effective. Contacts will not have any effect on diseases that enter the grass through the root system. Anything below the surface of the ground is out of the range of contact fungicides. They will not protect any new blades that develop after the contact was applied. It can only protect the grass it touched when it was applied. Systemics, on the other hand, will penetrate the grass blade or enter through the roots and work from the inside. They are longer lasting than contacts and will often last from 7 to 25 days or longer. They can be both curative (after the disease starts) and protective (before the disease begins). It often needs to be watered in after application to get the fungicide down to the root zone. Read the label carefully for specific directions on how to do that. Systemic lawn fungicides will attack lawn fungus from the inside. Any disease that enters from any point on the plant will be subject to the fungicide. This includes any new plant growth that occurred after the fungicide was applied. Systemics and contacts are often alternated to get the benefits of both types of fungicides. Before you completely dismiss contact fungicides in favor of systemics, you need to know what advantages each have. Contact lawn fungicides have what is known as a "Broad Base of Activity:. (Nick Christians, Iowa State Univ.) This means that contacts have numerous biochemical pathways that can disrupt and kill pathogenic fungi. Systemics have a Narrow Base of Activity. Systemics have a much lower amount of ways to disrupt and kill the fungus. With systemics, having only a few ways it can work, the chances are greater that the disease will develop a resistance to the fungicide. This occurs quite often and many diseases are slightly to greatly resistant to some fungicides. With contacts, however, there are more ways that it can attack and kill the lawn fungus. This means there is a much less chance of the lawn fungus becoming resistant. When using fungicides for reoccuring lawn disease problems, use more than one product. Alternate with different products in the same classification as well as using both systemics and contacts. Your chances of controlling the disease is far greater than you would have if you used only one. Some lawn fungicides have a "broad spectrum", meaning they can control or hinder the spread of many diseases. Others have a "narrow sprectrum", meaning there are only a few diseases they can affect. Carefully read the label to make sure it is what you need. You may have a selection between using an organic fungicide or a chemical fungicide. Broad spectrum organic fungicides such as liquid copper are labeled for many diseases of turf, vegetables, fruits, ornamentals and roses. Some homemade fungicides may do well in certain situations. Other homemade products are more beneficial to the homeowner's conscience than actually stopping the progression of a disease. Choosing the right product is where disease identification is important. Knowing the environmental conditions necessary for a diseases to occur along with the symptoms it displays is extremely helpful in diagnosing the problem and in selecting the right product. Using the wrong product for a disease that was misidentified may have no effect on the disease at all. For additional advice, review the section on lawn diseases or consult your county extension office. Learn about the different Agri-Gro Products and how they can benefit your lawn and plants. Are your maintenance practices weakening your grass? Stressed and weakened grass is more susceptible to disease. Using proven methods to care for your lawn is far more beneficial than you think. Profiles of common spring and fall diseases. Learn what they are, how to recognize disease symptoms, disease prevention, treatment options and more. Profiles of common summer lawn diseases. Some of the most destructive disease occur in summer. Learn how to identify them, recognize disease symptoms, how to prevent them, treatment options and more. Safety for yourself, your family and the environment should be your main concern. This page contains valuable information about safe use, storage, personal protective equipment (PPE) and more.